Both the Portland and Lake Oswego city councils have voted to move ahead with a streetcar extension which will link the two communities, connecting with the existing system on the South Waterfront. The approvals are significant but are only very preliminary steps before construction on the $458-million project can actually begin. There is still vocal opposition from some Lake Oswego residents — that city's council vote was 4-3 — and Portland Mayor Sam Adams is starting to sound lukewarm about the scheme after formerly being a solid supporter. "I am not ready to sign off on this project," Adams told The Oregonian. Some Portland council members are also reportedly wavering despite a 4-1 vote to continue planning the streetcar as the preferred transit alternative in the Highway 43 corridor. Supporters believe a streetcar will help drive development, as it did in downtown Portland, and will be more effective than any bus alternative. The next step will be gaining initial approvals from Multnomah County, Clackamas County, the regional Metro Council and TriMet. Then the pre-preliminary engineering phase would begin and funding sources would be finalized; a 60-percent federal share would be required. Preliminary engineering is tentatively set to start at the beginning of 2013 and be completed about a year later, followed by final design. 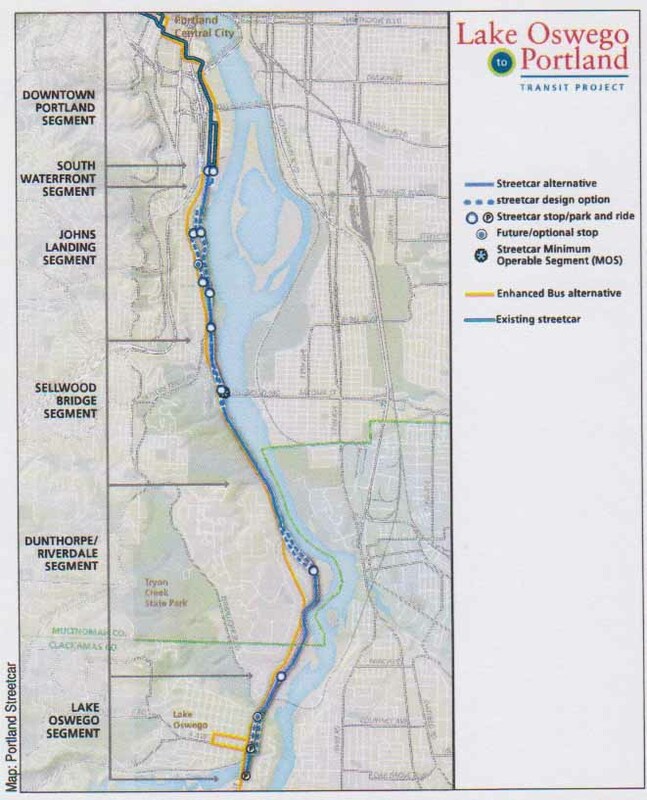 If Portland and Lake Oswego give final approval, construction could begin in 2015.